Ram Charan was spotted with producer DVV Dhanayya in Bangkok today and a photo of the actor is going viral on social media. Actor Ram Charan will next team up with Boyapati Srinu for an action entertainer which will have the mega power star playing an intense role. The film will have a heavy star cast with actors like Naveen Chandra and Tamil actor Prashanth playing important roles. Ram Charan has now flown to Bangkok to shoot for important scenes involving him. 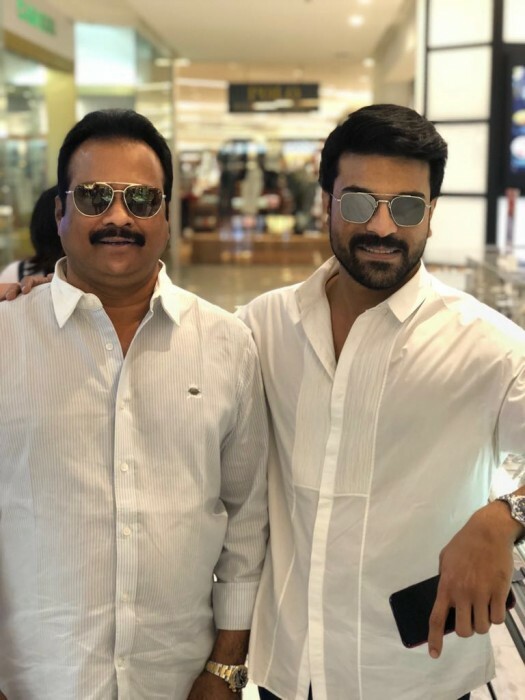 And Ram Charan was spotted with producer DVV Dhanayya in Bangkok today and a photo of the actor is going viral on social media. Ram Charan looks fitter as ever in his look for the Boyapati film for which he has trained hard before commencing shoot for this film with Boyapati Srinu. Bollywood actor Vivek Oberoi will be making his debut in Telugu with this yet to be titled film and will be seen playing the antagonist in it. The film is said to be a trademark Boyapati Srinu story and will have some rocking action scenes. This yet to be titled film will be Ram Charan’s first time association with Boyapati Srinu. Kiara Advani has been roped in as the leading lady for this film and will be her second film in Telugu after Bharat Ane Nenu. Ram Charan will be sporting a very fit look in this film and the actor has been working out to get into the shape. Ram Charan is training hard and sweating it out in the gym at the present moment. According to reports, Ram Charan is working out under the guidance of Salman Khan’s trainer Rakesh Vudiyar and will be getting into the required shape. Ram Charan’s wife, Upasana, took to social media and posted a picture of Ram Charan who had finished a session of workout and looked fitter as ever. The makers are looking to release it before the end of this year, reports reveal.